52. Rabbi Reuven Stamov, a native of Crimea and citizen of Israel, arrived in Kyiv with his family in March 2012 to become the first Masorti/Conservative rabbi in the post-Soviet states. Although the Conservative movement has operated a day school in Chernivtsi (western Ukraine, close to the border with Romania), an activities center in Kyiv, a Ramah summer camp, and certain other programs in Ukraine for some years, appointment of a fulltime rabbi is a major upgrade in their portfolio. Rabbi Stamov completed rabbinical preparation at the Schechter Rabbinical School in Jerusalem; during his seven-year course of studies, he returned frequently to Ukraine to lead Shabbatonim, direct summer camp ses-sions, and undertake other responsibilities that helped to strengthen Masorti in Ukraine. 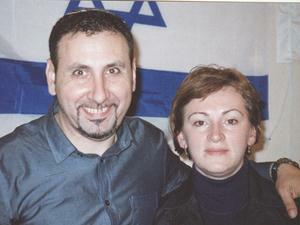 Rabbi Reuven and Lena Stamov, both natives of Ukraine, arrived in Kyiv from Israel in March 2012 to lead the Conservative/Masorti movement in Ukraine. Their Kyiv plans for the future include expansion of the Sunday school, development of a teen club, further training of madrichim, a seminar/lecture series for adults, a conversion program, Friday evening Shabbat services, and a Jewish-theme music and dance ensemble for children and teens. Rabbi Stamov also may deepen his involvement with a Bar and Bat Mitzvah program sponsored by the Jewish Agency. Plans to add Jewish content to an existing public school with significant Jewish enrollment have been postponed for at least one year due to financial constraints. 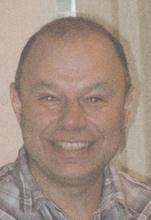 Vladimir Sapiro is the lead Hebrew teacher in the Masorti community in Kyiv. He is the author of a textbook series for Hebrew-language students. Rabbi Stamov plans to provide assistance to small groups of Conservative Jews that have formed in other cities, including Chernivtsi, Berdychiv, Kirovohrad, Mykolaiv, Kharkiv, and Simferopol. Leaders from these nascent communities come together at Camp Ramah and at various seminars, including those preparing teachers for Sunday schools. Rabbi Stamov has received an appeal from Jews in Odesa who would like to establish a Conservative community in that major port city, but he is wary about venturing into a city with a well-known "Jewish war" between two feuding Orthodox rabbis. 53. Rabbi Aleksandr Dukhovny, a native of Kyiv, has been rabbi of the Progressive/Reform Kyiv Hatikvah Congregation for 13 years, succeeding several foreign-born rabbis who had served in the position for much shorter periods. He completed his rabbinic training at the Rabbi Leo Baeck Rabbinic Training Seminary in London. His congregation now has almost 500 members, said Rabbi Dukhovny, most of whom are dues-paying. Hatikvah Congregation is governed by an active Board, Rabbi Dukhovny noted. Hatikvah currently occupies a ground-floor 110-square meter apartment that includes a 60-seat hall, several smaller rooms, and offices. These premises are the seventh base for the congregation in its 20 years of existence, said Rabbi Dukhovny. The World Union for Progressive Judaism (WUPJ) has allocated $1.5 million for the purchase of new premises in a central location close to public transportation, Rabbi Dukhovny stated. They are seeking space of about 500 square meters that can accommodate a prayer hall, classrooms, and offices. These quarters must be in a modern and attractive building, centrally located, and easily accessible by public transportation. Rabbi Dukhovny declared that he and members of his local board, along with an attorney, have explored more than 100 properties that, theoretically, meet their needs, but ownership and/or other legal issues often lack clarity, thus precluding purchase. Forty-seven WUPJ congregations exist in Ukraine, most of them in smaller cities and towns; all are appropriately registered with relevant state authorities. More than 20 of these operate a full range of activities, said Rabbi Dukhovny, and the remainder offer selected programs. WUPJ subsidizes only two of these congregations, Hatikvah in Kyiv and the Progressive congregation in Yevpatoriya. Seven congregations have their own physical premises, usually pre-war synagogues that were restored to the Jewish community after being used for other purposes in past decades, stated Rabbi Dukhovny. He observed that possession of physical premises frequently brings Jewish businessmen into the community because they see an actual structure that they can develop and maintain. Congregational twinning programs with congregations in the West often are key components in the success of various local congregations, he noted. The additional funds that these relationships generate may enable local groups to offer programs that they could not otherwise support. A delegation of 34 individuals from a Reform congregation in London, Rabbi Dukhovny continued, recently visited its twin congregation in Lviv and agreed to provide assistance enabling the Lviv group to aid Lviv elderly Jews ineligible for support from the Conference on Jewish Material Claims against Germany (Claims Conference). His own Hatikvah Congregation is renewing a lapsed relationship with a Reform congregation in Pittsburg, Rabbi Dukhovny stated. Rabbi Alexander Dukhovny is the Chief Rabbi of Kyiv and Ukraine for Progressive Jewry. He is a native of Kyiv and was ordained at the Leo Baeck Rabbinic Training Seminary in London. Photo: Открытая дверь (Киев: World Union for Progressive Judaism in Ukraine, c.2012), 3. His own rabbinate, said Rabbi Dukhovny, includes substantial counseling to families and to Jews in hospitals and prisons. He also prepares people for conversion to Judaism, some of whom have no prior links to Judaism or the Jewish people. He uses Skype, he continued, to educate Jews in distant Ukrainian congregations, to work with Progressive youth groups, and to communicate with twin congregations in other countries. The next major Ukrainian city to be assigned a Progressive rabbi, said Rabbi Dukhovny, probably will be Odesa. An Odesa-born rabbinic student at the Leo Baeck seminary in London is already fulfilling student rabbi assignments at an established congregation in her native city and may become its rabbi after her ordination. WUPJ has designated Odesa as one of its priority cities for expansion in the post-Soviet states, Rabbi Dukhovny stated. In response to a question, Rabbi Dukhovny said that the World Union for Progressive Judaism would operate two one-week summer camp sessions at a site in the Crimean mountains in 2012. Each session would accommodate about 150 youngsters. WUPJ will provide a significant subsidy for one session, and a grant from the Dutch Jewish Humanitarian Fund will support the other session. Rabbi Dukhovny added that some madrichim (counselors) are Israelis trained by the Jewish Agency for Israel and that others come from the Reform movement's own ranks in Ukraine. Rabbi Dukhovny described his working relations with the Jewish Agency, Israel Cultural Center, and Limmud as excellent. However, he observed, Rabbi Yaakov Dov Bleich continues to block him from participating in various rabbinic groups. He expressed concern about the new presence of a Masorti/Conservative rabbi in Kyiv, clearly perceiving Rabbi Reuven Stamov as a competitor. Rabbi Dukhovny suggested that leadership of WUPJ and Masorti Olami (the Masorti international umbrella group) formulate an agreement defining spheres of operation in Kyiv. Rabbi Stamov, said Rabbi Dukhovny, should understand that Jewish intellectuals in the Ukrainian capital are involved in the Reform movement. 54. The writer did not visit the Joint Distribution Committee hesed, which is operating at reduced capacity due to severe budgetary constraints and problems with the hesed building itself. According to Amir Ben-Tzvi, JDC director in Kyiv, the hesed kitchen is operated by an outside company under contract; it prepares [non-kosher] food both for the hesed day care clients and for certain non-Jewish commercial clients. The soup kitchen for Jewish elderly no longer exists. In addition to senior adult day programs, said Mr. Ben-Tzvi, the hesed continues to house certain other services for Kyiv Jews. However, the condition of the building itself and its location on a small hill far from public transportation lines limit its effectiveness. The World Union for Progressive Judaism now is sending most Russian-speaking rabbinic students to Abraham Geiger College, a rabbinic seminary of the University of Potsdam in Potsdam, Germany, because it trains rabbis free of charge. The Dutch Jewish Humanitarian Fund (Joods Humanitair Fonds) was established in 2002. Its mission is to support projects restoring Jewish life in former Communist countries, Jewish education, mutual respect between people, and civilian victims in war zones. Its asset base derives from unclaimed Jewish property remaining in the Netherlands following World War II and the Holocaust. See pages 94-95 for a report of an interview with Mr. Ben-Tzvi.